The list of official 2014/15 Invitees and Alternates for the 30th annual Quiksilver in Memory of Eddie Aikau, at Waimea Bay, have been announced. The famous big wave surfing event will be run if waves meet a 20-foot minimum height (Hawaiian Scale), during the holding period of December 1st, 2014, through February 28, 2015. “The Eddie” honors Hawaiian waterman and hero Eddie Aikau, 31, who lost his life somewhere in the Pacific Ocean in search of help for the stranded crew members of Hokule’a. Filled with a pure passion to ride giant surf, take care of his fellow man, and uphold his Hawaiian culture and family values, Aikau became the benchmark by which all big wave riders are measured. The Quiksilver in Memory of Eddie Aikau has only been held a total of eight times: it’s inaugural year at Sunset Beach, and then seven more times at its permanent home of Waimea Bay. 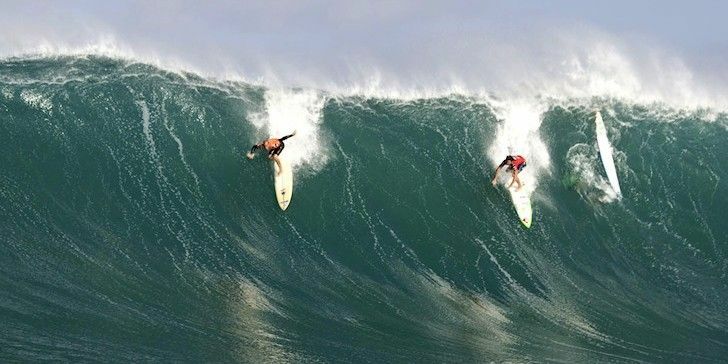 “The Eddie” was last held on December 9th, 2009, won by California’s Greg Long. If “The Bay Calls The Day”, Bruce Irons, Clyde Aikau, Garrett Mcnamara, Grant Baker, Jamie O’Brien, Kelly Slater, Makua Rothman, Peter Mel, Shane Dorian, Ross Clarke-Jones, Jeremy Flores and many more will hit the giants.